Intriguing, dedicated, elusive, resolute, scholarly, unpredictable, uncompromising. The accounts that have attempted to chronicle the storied life of trumpeter Dizzy Reece have painted the picture of an artist who is all of the aforementioned things. Yet not a one has been able to encapsulate every aspect of Reece’s life. 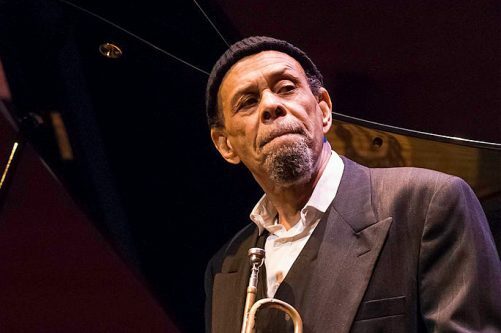 Unlike those of the jazz greats he has played with: Dizzy Gillespie, Art Blakey and John Coltrane amongst them, there are elements of the hard bop luminary’s narrative that remain unresolved – and that the eighty-seven-year-old appears in no hurry to clarify. This, along with the many interesting stories and the catalogue of recordings and books made by Reece, make him one of contemporary jazz’s most interesting figures. Pianist Trevor Watkis is one musician who has built a strong relationship with Reece. He is to present his ‘Routes in Jazz’ retrospective, a show featuring brand new arrangements of Dizzy Reece compositions, in January 2019, honouring Reece’s accomplishments and celebrating how the Kingston-born artist departed the Caribbean on the Windrush to pursue a career in Europe. Ahead of the show, here’s the first part of a history on Dizzy Reece, a man described as ‘one of jazz’s best and most under-appreciated trumpeters.’ by Christopher Porter of Jazz Times. Alphonso Son “Dizzy” Reece was born in Kingston, Jamaica in 1931. It is said that his nickname links to some of his erratic childhood behaviour: the wandering and roaming that saw him turning up at political marches and public gatherings, or being generally mischievous. In approximately 1943, he enrolled at the Alpha Boys School, (now called the Alpha Institute), an institution which has had a school band since the late 19th century. While there, his classmates included Joe Harriott, the saxophonist known for his ‘Indo-jazz fusions’ amongst other records, saxophonist Wilton Gaynair and founder members of The Skatalites. It was there that Reece, at the age of 14, took up trumpet, the instrument with which he would pursue a professional music career. At the age of sixteen, Reece was playing with Jack Brown’s Swing Stars in Kingston, but recognising his talent, his mother encouraged him to board the HMT Empire Windrush, bound for England. As one might imagine, Reece wasn’t rooted to one particular location having arrived in England. He has spoken during interview about spending time in London, Lancashire and Merseyside while in the UK during the fifties, but he also travelled further into Europe as well. Before the turn of the decade, Reece has suggested that he could be found in Paris with tenor saxophonist Don Byas, who he later accompanied in Germany and Holland. “In Paris was the first time I saw Charlie Parker and Miles Davis,” he told Clifford Allen in 2005, referring to their separate ensembles, “they played the first Paris jazz festival in 1949”. Back in the UK shortly thereafter, Reece was able to establish himself and build key relationships in the music scene. Some of his earliest assignments in England saw him playing with Victor Feldman, Kenny Graham’s Afro-Cubists and the Tony Crombie Orchestra, which he joined in the Autumn of 1954, according to Jack Cooke’s 1959 article for Jazz Monthly. May, 1955 saw Reece working on his first recordings as a leader – the ones which would eventually comprise the album, A New Star. A four track EP featuring Ronnie Scott, Reece and his quartet (Ginger Baker mentor Phil Seamen amongst the quartet members) arrived the same year, further solidifying his place within London’s scene and leading on to his 1957 record, Progress Report, which featured the aforementioned Seamen, Scott and Feldman. Despite suggestion that Reece was tricky to work with, the quartet are said to have had a great rapport, although their time together was all too short. Tony Hall, Reece’s manager in the UK during the fifties, is the man credited with securing Reece his Blue Note recording contract toward the end of the decade. In the liner notes for Blues in Trinity, Reece’s first Blue Note album recorded at Decca Studios, London in August 1958 – Hall suggests that two years earlier, he had sent recordings of Reece to Miles Davis and that the trumpeter had taken the trouble to ‘phone critic Nat Hentoff and say “there’s a great trumpeter over in England: a guy who’s got soul and originality and above all, who’s not afraid to blow with fire.” That could well be hubris, but Hall goes on to speculate that Davis must’ve played the recordings to his peers, as months later, American jazzmen were reaching Paris and enquiring after Reece, the musician that Miles had told them about. Reece affirms that it was Miles Davis who encouraged him to make the move to New York and that he did so in October, 1959. Having arrived in New York, Reece wasted little time immersing himself in the city’s thriving jazz scene. On November 10th, he was part of sessions for Art Blakey’s Africaine, playing not trumpet but congas, as he had previously with Kenny Graham’s Afro-Cubists. The session is notable for being Wayne Shorter’s first recording date and the great Lee Morgan was the man Reece would’ve witnessed playing trumpet that day. Nine days later and a first session at Rudy Van Gelder’s legendary Englewood Cliffs studio beckoned. Reece, saxophonist Hank Mobley, pianist Wynton Kelly, drummer Art Taylor and bassist Paul Chambers convened to record the material for Star Bright, an album which today is still considered one of his finest, not to mention a lesser-praised gem in the Blue Note catalogue. He would record the material that eventually found commercial release in 1999 as Comin’ On, either side of the Star Bright recording date and in August of 1960, partook in sessions for Duke Jordan’s Flight To Jordan, with a young Stanley Turrentine on tenor saxophone. It is felt that Reece’s relocation to New York hadn’t had the desired effect in terms of career progression and that the environment he had entered into wasn’t the most wholesome for a new family. He told Jazz Times in 2004, “When I came here [to New York] with my wife, I got negative feedback. A lot of people [jazz musicians] took umbrage at an integrated marriage”. The couple are said to have split up soon after, with Reece’s wife moving back to England along with their daughters. Reece’s ship hadn’t run aground, but plain sailing it was not. Despite that, there were still incredible things occurring from day to day in New York’s jazz scene, that he was a key part of. In the summer of 1961, an informal jazz summit took place in Central Park, some twenty-one influential jazz trumpeters meeting and featuring in a photo which is the trumpet player’s equivalent to the famous A Great Day in Harlem photograph. Reece can be seen seated, in between the heads of Roy Eldridge and Dizzy Gillespie, soaking in the sunshine with his fellow musical innovators.